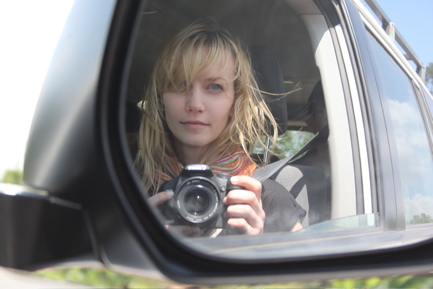 Oh man, early mornings and me just don’t get on… 7am and heading back to Dilla to visit the Chelba washing station that we bought from a couple of years ago. Dile, our awesome grumpy driver with a heart of gold, and guide, agronomist and Q grader Addis Ababa (same as the city, means ‘new flower’ I found out!) patiently answered questions while dodging people, goats and donkeys wandering onto the road. Some of the questions around the trace chemical causing problems when importing Ethiopian coffee to Japan were clarified a bit. 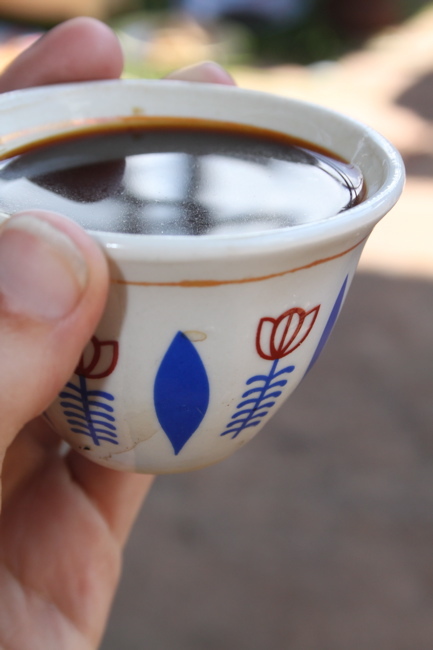 Addis told me that a couple of years ago, the problems got to the point that Japan practically stopped buying Ethiopian coffee all together and in order to resolve the situation the Japanese Ministry of Agriculture dispatched a team to test the soils, waters and other elements that could be to blame. The conclusion was that the likely contaminate was jute bags, since they get re-used for various purposes over periods of up to 10 years. The many functions they would have had was the reason why cross contamination was happening and coffee got traces of chemicals on them. Now, jutebags for coffee have to be unused and will be printed with the year of use on them, so that if one re-surfaces it can be identified and discarded, or the party re-using it will be severely fined. 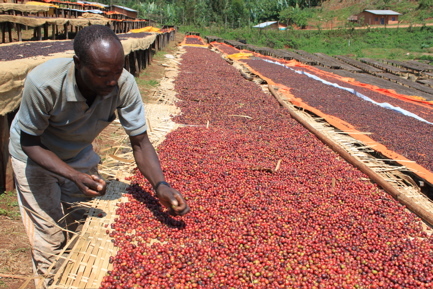 Being an agronomist, Addis loosely touched upon some subjects regarding growing coffee that I need to pick his brain more on, like the establishment of new coffee research centers back in the mid-70’s aimed at solving the problems Ethiopia was seeing with coffee berry disease. 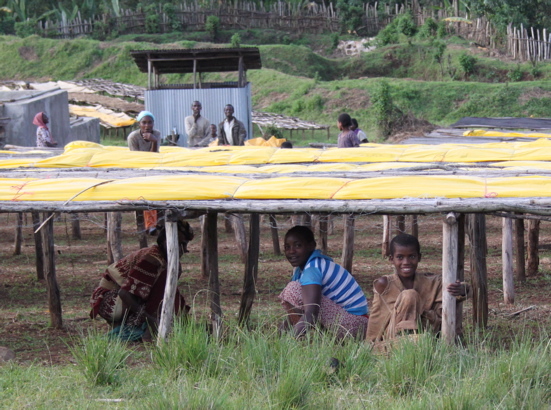 Back then, coffee was 90% of Ethiopias exports, and of course any threats to the crop had to be avoided. They refined and mapped 3 different main structures of trees; like the open 75227, the compact 74110 or 74112 and the semi compact, 7454 being one. (Still not very romantic!) These 3 categories indicate how tall, wide and densely branched the trees look, and some will be more suited to certain climates than others. 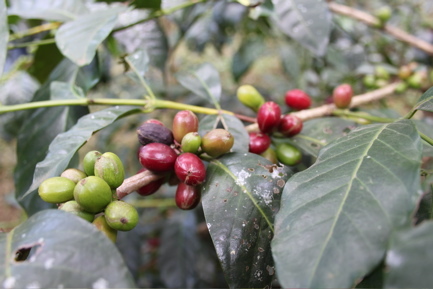 The 75227 would for example be a tall tree reaching 2.5 meters if allowed, branches spaced far apart allowing lots of sun onto the cherries, and producing medium quantities of coffee. I’m going to try and get some more facts and figures on this when back in town. 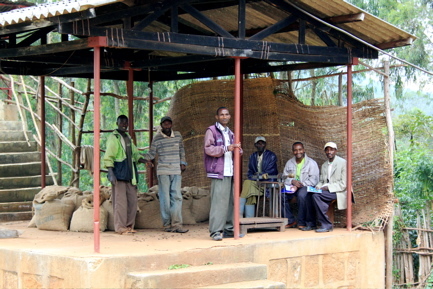 Addis have done a lot of research into the changes the EXC has brought to coffee production and producers in Ethiopia, and is very pleased that now, farmers are getting paid maybe three times as much for their cherry as they used to – being more informed and savvy about what the C price is at and how the national and international markets are doing. I still need to sit down and work out what the birr/farsula of parchment-price at the ECX means in £/kg green, and what all the added costs of transport and fees break down to, and how that relates to what importers and roasters pay. If I was better at maths I probably wouldn’t feel so broken-headed by the complex systems and layers of the trade here, every time I think I’ve worked something out I speak to someone new who tells me I’m wrong or that I’ve not considered an element I didn’t even know existed. Everyone here is friendly and helpful, but sometimes it’s a bit like pulling teeth in that people might only tell you the minimum of information required, not offering up additional facts or figure that would explain discrepancies, things that seem out of context or downright unfeasible. To add to my confusion, it seems the government and the ECX likes to change or make new rules on a regular basis too, so keeping up with it all seems hard enough for those who are based here and see it every day. For example, rules now say that coffee- once the contract is registered- has to be shipped out within four months. If you register your contract on January 1st with a shipment window of Mar/Apr your coffee has to ship by April 30th or you’ll be fined and suspended from registering another contract or exporting anything else till the backlog is cleared. From the governments side this is done to prevent hoarding of stocks in times when there is much speculation on prices going up, making sure the money expected to come in a the stipulated time does indeed come in, and I guess also to prevent coffee from going old in storage damaging the quality reputation of Ethiopia. 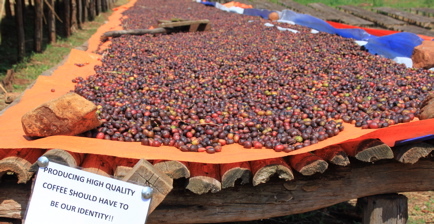 While of course there are benefits of moving coffee out quickly from a storage perspective, many exporters feel that the quality will not necessarily suffer as long as the greens are kept well in parchment or cherry up until a reasonable time of export. But there are certain complications to this deadline of two months as well, for example the way it puts pressure on shipping samples to be sent off half way around the world in time for cupping and approval. Not to mention what would happen should the samples not be approved in time due to unforeseen circumstances that are not really anyones fault- but punishes the whole chain if it gets delayed. 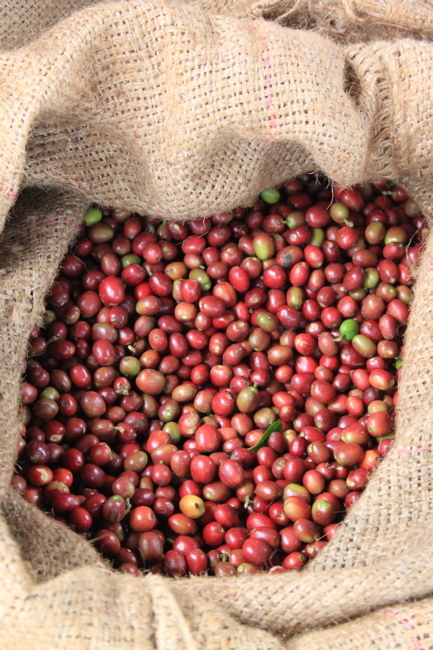 Another thing that has been boggling my mind is talk of a directive introduced just a couple of weeks ago, that says coffee should be exported in fully lined containers as opposed to jutebags. 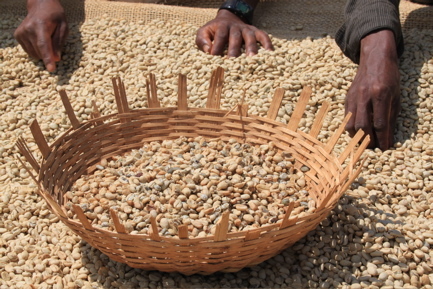 Apparently this was done by (I believe) the Ministry of Trade to prevent certain issues they see as detrimental to the coffee: it would reduce the weightloss from spiking every jutebag to collect pre-ship samples, to eliminate the cost of the jutebag itself, and avoid any contamination issues the coffee could face in transport to Djibouti. But of course, the cons for coffee buyers is that not everyone is capable of receiving a containerload of coffee at a time and you can’t ship mixed containers of different lots or regions. I think somewhere like Japan, who only just started buying Ethiopian coffee again, won’t allow bulk shipping like this because they collect samples from smaller unit bag to check for chemical contaminates. The general opinion is that this directive will need to be overturned, and fast, as the logistics of pulling this off are just not doable, and will cause all sorts of issues not just for exporters but importers and buyers alike. Driving long distances every day helps with digesting the information that comes in rapid fire every time we stop at a farm, a washing station or an exporter, but most of the time in the car I’m just captivated by the scenes flying past. The road from Addis to Yirgacheffe changes so much in character, from the endless industrial zones on the outskirts of Addis fading into the yellow fields of taf, the shimmering lakes between Ziway and Negele, the grassy plains leading up to the two mountains marking the start of Sidamo, and the climb up into ever more green and lush surroundings as coffee trees start to appear. Every now and then you can see a priest dressed in the most colourful cloak sat patiently by the road collecting money, but most of all it’s bustling with people pitched up to sell anything from gasoline to onions, chat to little carved chairs. Graves appear with regular intervals in the lowland (I say low but it’s still 1600 masl), where traditionally people are buried near their houses so their souls remain at home. They are often more like little monuments, richly decorated with pictures and words depicting the loved one. One particular grave that’s been catching my eye when I pass is one with a statue of an ox on one side, showing that the person resting here was a hard working farmer. 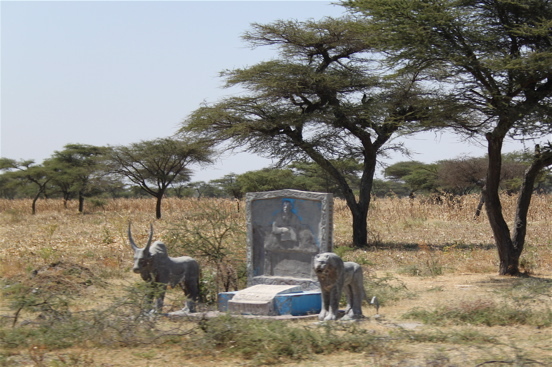 On the other side of the headstone is a sculpture of a lion, speaking of his strength as a powerful man, and like all Ethiopians a very proud person. 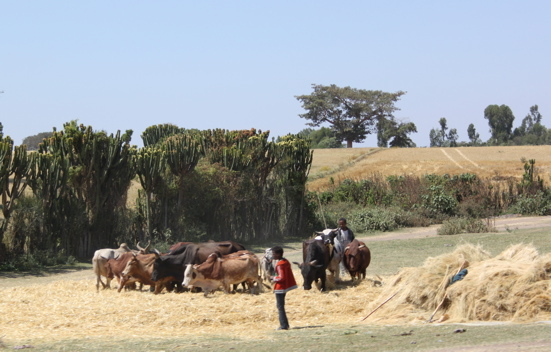 Next to piles of drying hay you’ll see cattle being walked around in circles, threshing the spread out layer of grains under their hooves. 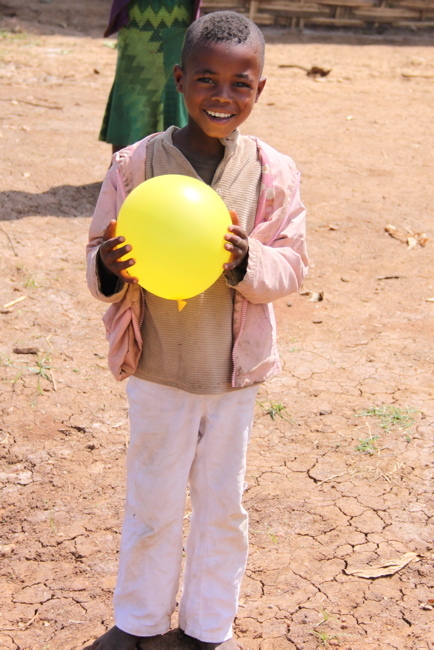 A little whirlwind was whisking up a column of dust next to the road out of Heki, a larger one creating a huge cloud of flying pieces of straw, with a little boy running around in the middle trying to catch them all. Draped over bushes and rocks you see colourful clothing and left out to dry in the scorching sun, mothers combing their daughters’ hair, boys playing tether-ball and football, girls skipping rope and kids with wheels and sticks doing what kids with wheels and sticks would be doing in any country. Donkeys roll around in the dusty ditches trying to scratch some itch, and up in the higher grounds you can see certain minerals in the red, exposed soil glimmer in the low sun like specks of silver. 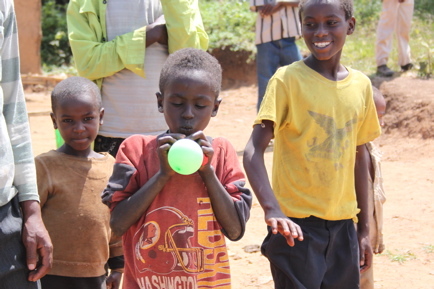 Smoke seeps out of the straw rooftops of the gojo bet traditional dwellings, and grown ups and kids alike carry their ubiquitous yellow water containers to the filling station and home. 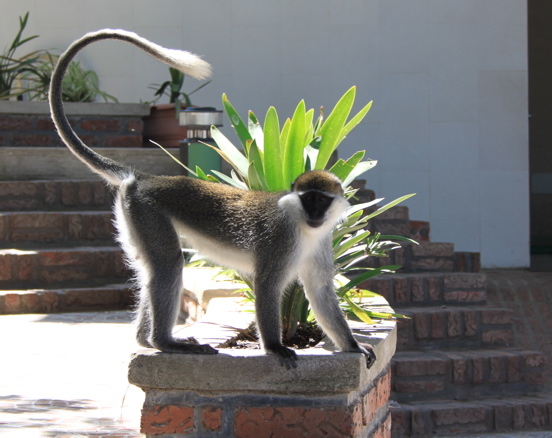 I now know that a good way of doing laundry is by placing a large banana leaf on the ground, your trousers on top, and scrubbing them with soap a brush till they can be rinsed in a stream. 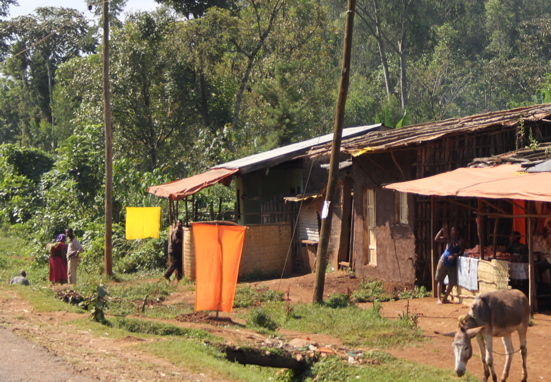 In front of some houses you’ll see a bowl or a cup, or pieces of yellow or pink cloth hung up on a frame signaling that this house will sell you home made meals and drinks, and herds of cattle take their baths in rivers, cooling off in the rushing waters while their owners rest in the shade. 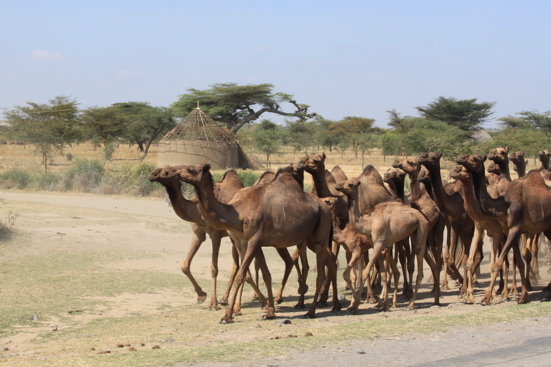 Another herd I’ve seen only sporadically is the camel herds of the Afar tribe, who are nomadic and move around on the lower plains. 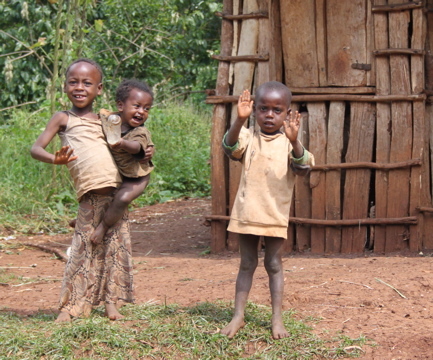 Covering an area of the countryside that is also well suited for growing sugar cane has recently brought with it some changes or opportunity for this tribe, as the government in a trade off for using some of the land for this new crop have given some infrastructure like irrigation and schools. The tribe have taken the project on as their own chance to control how they move with the times without loosing their identity. 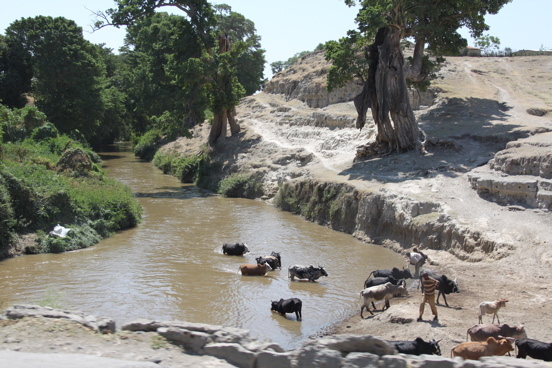 The irrigation for example means they can grow grass for their camels and move around less to find pasture, freeing up more land for uninterrupted sugar cane production. They now produce enough sugar here to cover national consumption and have some spare to export too. 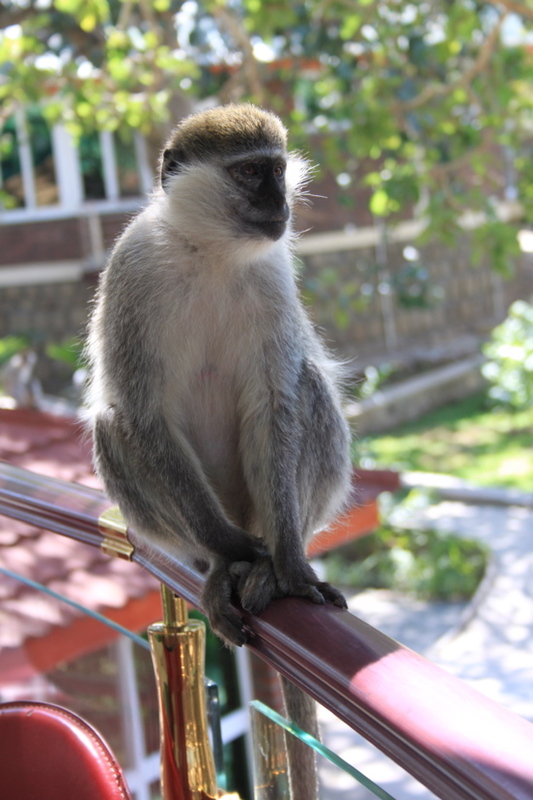 Stopping for lunch by the lovely Lake Awasa I got up close and personal with some very cheeky monkeys- I know James will be very jealous of this one! But finally, about 25 km south of Dilla we pulled off the road and through the Chelba washing station gates. As we parked up I suddenly felt like spending a bit less time looking at machinery and washing tanks that I normally do, and more time hanging out with the Chelba crew. 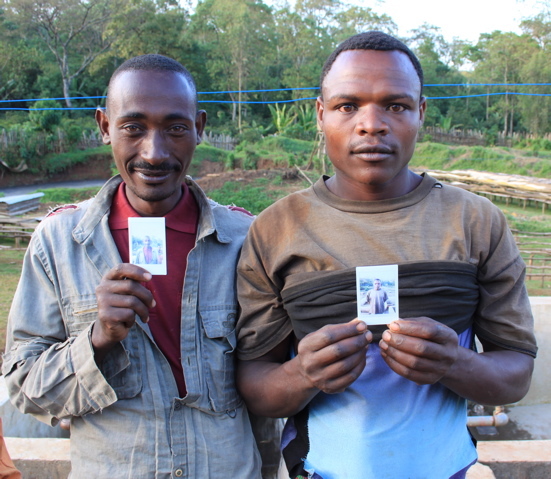 So after many curious looks and smiles I pulled out my polaroid to help break the silence, resulting in a full on photo shoot where about 30 of the guys and girls crowded round to have their image captured and handed over. After that it was great to just wander around and having them show off how the structure there works, smell the difference in parchment with 1 day vs 6 days on the drying beds, take pictures with Hussein the very handsome site manager and basically just relax as dusk fell, mist started coming in and the noise of the crickets took over from the machines and trucks. Staying in a hotel in Dilla tonight, currently the bar staff if playing ‘Alejandro’ on the stereo and I’m having flashbacks to Bogota and Andres, very odd. Sunday morning bright and early we set off to meet the owner of a farm very close to our hears at Square Mile, Suke Quto, the one who grew the coffee John used to win the UKBC! Tesfaye had a meeting in Awasa so was not going to be able to meet us at the farm, so we met for breakfast in Dilla instead- and I was able to convey Johns gratitude for producing such lovely, award winning beans! 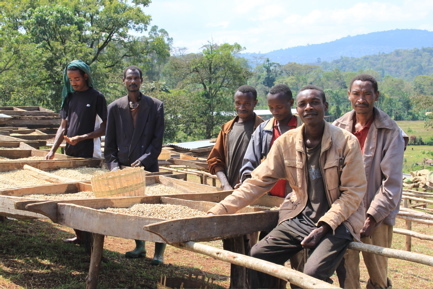 Tesfaye grows his own coffee and works with 40 outgrowers who deliver to his washing station as well, exporting about 8 containers of coffee in a harvest. As with everyone else, work at the processing station has just begun as cherry is delayed by 1-2 months across the board. 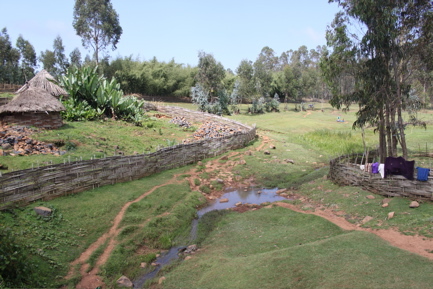 In Tesfayes case, the rains that fell in February kicking off the normal season was great, the trees were full of flowers and the harvest forecast was looking good. Then the expected March rains didn’t come, and almost all of April went by without any more showers too. By the time the rain came back the February flowers had already wilted and dropped. Confused but wired to reproduce, the trees produced a new flowering in early May, but it’s not as full as the first one and the crop is projected to be smaller than last year. This is of course a financial challenge, but Tesfaye hopes the market will allow for him to pay both his outgrowers and staff more money this year in spite of the reduced volume. 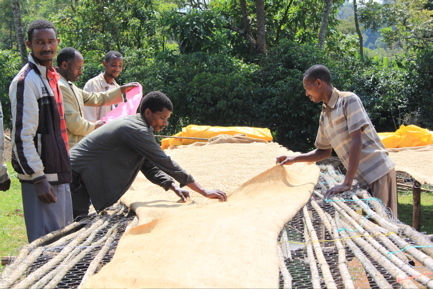 With the combined skill of Tesfaye who holds a degree in Natural Resource Management, the beautifully set up mill and a team of skilled processors, quality should not suffer and I’m really looking forward to samples of the finished product. 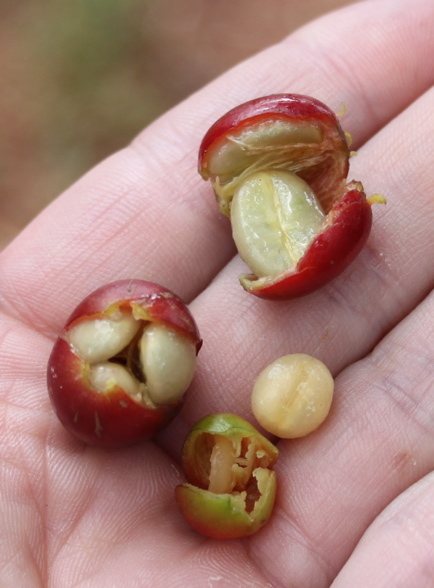 Tesfaye filled me in a bit on the history of Suke Quto, which is very much a labor of love for coffee but also the nature and landscape it grows within. The farm is named after a tree that grows in the local area, which is in the Shakiso district and also part of a huge gold mining- zone. Some years ago there was a massive forest fire that took out a the forest and any chance it might recover, so people started encroaching on the cleared land left behind they and began growing food crops. 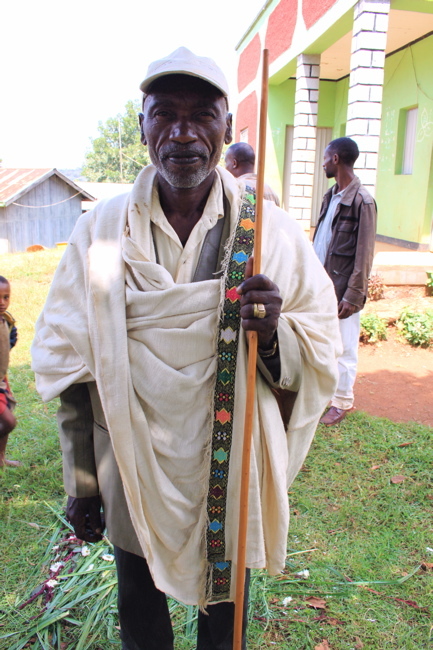 Tesfaye saw an opportunity to grow coffee in the fertile soil, but only a few people in the area knew anything about growing coffee and to start with he was met with some resistance. Taking it slow he began planting coffee along the borders of the encroachment area, 5 hectares at first but now it’s grown to 291 hectares. 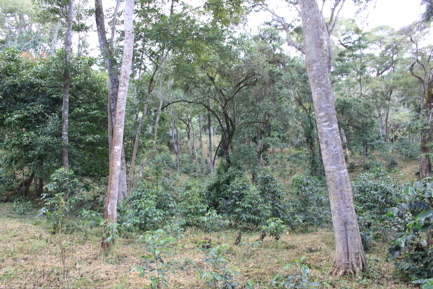 But preserving the natural forest is key for Tesfaye, and he says there are still more natural trees on the land than coffee trees. As he respectfully puts it: ‘Coffee is income, but trees are life”. The forests full of birds, monkeys and other wildlife, he’s happy to live in symbiosis with what was there first, laughing at the notion that he collects only the cherries that the birds couldn’t be bothered eating first! 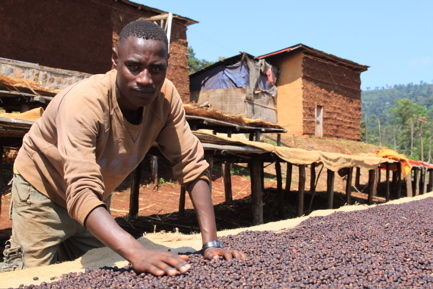 When Tesfaye started up he didn’t go to buy seedlings from any nursery growing one of the 26 varietals researched and developed by the government, he looked at the coffee trees that were in the area already and chose the healthiest, highest yielding ones to collect seeds from. This is still how he works, and right now he has a separate nursery site where 150 000 seedlings are maturing, ready to be divided up and planted on his own farm as well as the farms of the outgrowers. 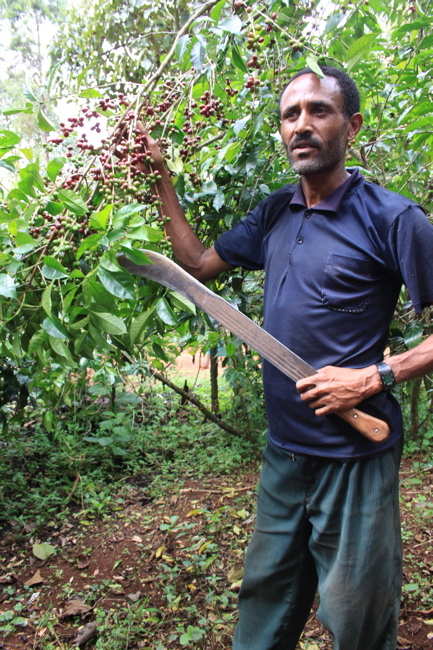 He has plans to convert some steep slopes on his land from shrubs and low tree growth to coffee, slopes which form two sides of a valley, and he’s interested to see what difference in taste he will get depending on whether the coffee trees get the sun in the morning or in the afternoon. 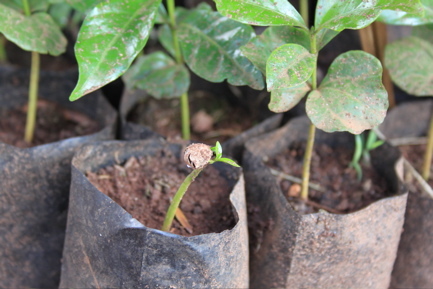 Coffee grown here will help bind the soil and keep erosion at bay while at the same time increasing his production capacity, hopefully preserving both the future of the land and the future of his family. With a baby on the way in March, there might soon be someone to help carry on that way of thinking. I’m really pleased I go the chance to meet with him this morning, and after all that I was really looking forward to seeing the place for myself. 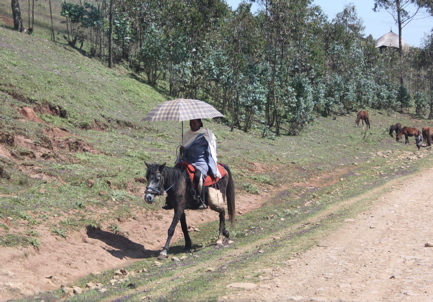 The drive to the washing station was going to be a good few hours on bumpy roads, so we planned to meet for a cupping in Addis on Saturday and set off in each our direction. 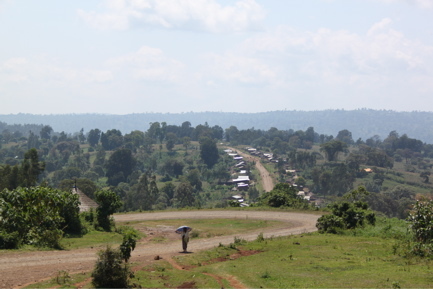 The road to Suke Quto, moving you from the Gedeo to the Guji zone, must be one of the most heartbreakingly beautiful areas in the world. Thinking back to Harar I might as well have been on a different planet, the land here so green and fertile, and mist drifting in through the valleys casting a dream-like veil over the forests. 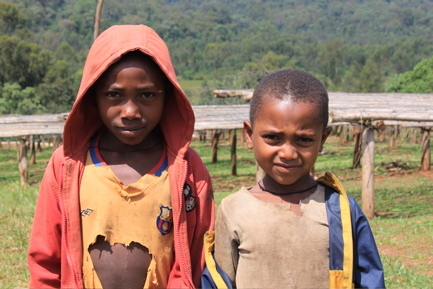 As we climbed to 2100 masl we passed through villages teeming with life, one where an ongoing livestock market meant every adult and child along the road was walking, coercing or chasing animals of all sizes trying to get them to move in the right direction. 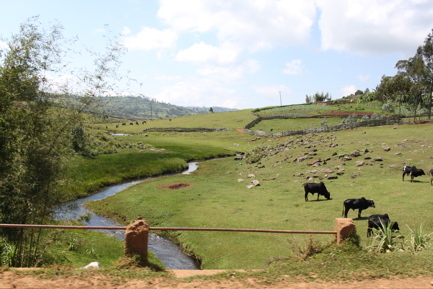 Here where the land can support them, I’ve been seeing a lot more cows and horses than goats and donkeys, and heading towards Uraga the land turned from dense forest to arable land, neatly divided into plots of pasture weaving soft patterns along the hillsides. Here life seemed to trundle along much as it does most places on a Sunday, women gossiping over the lattice fencing, young sweethearts shyly letting go of each others hands as we got near, ladies riding along on their horses protecting themselves from the sun with umbrellas, toddlers caring for and playing with their baby brothers and sisters, groups of girls braiding each others hair. I find myself thinking of my grandma, who grew up on a farm and married a farmer, never left the country and probably never even had a conversation with an African, Asian or Latin-American person. I think she would have enjoyed it, and I wish she was still around to hear about the places that her granddaughter is able to go to now. Anyway, it seemed we drove for hours but all of a sudden we rounded a corner and there was the mill! While this time last year the beds were full of parchment, only a few of them are now in use, and only to dry full cherry. 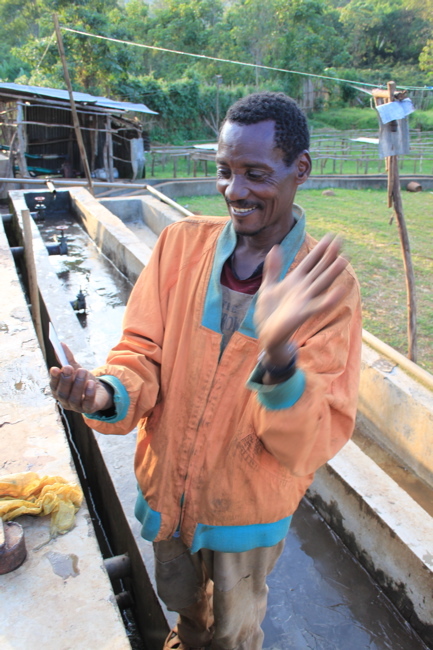 With a few early pickings coming in only in drips and drabs it’s not yet worthwhile cranking up the whole washing station, but Tesfaye expected it to only be a matter of weeks till the pulpers are up and running. 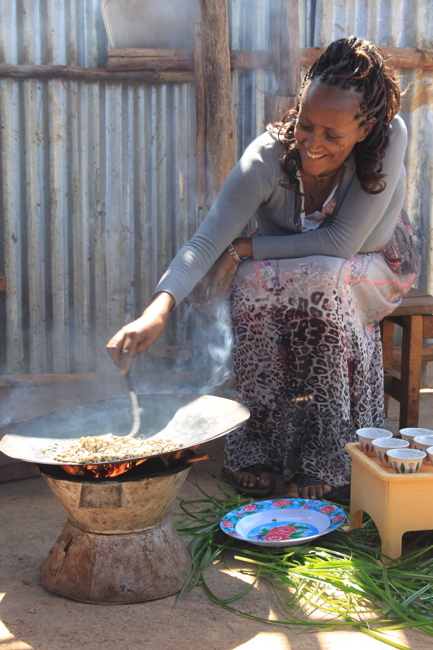 Addis Alem who had driven with us from Dilla and up here put on an impromptu coffee ceremony for us, a lovely surprise and very idyllic sat in the shed covering the receiving tank. 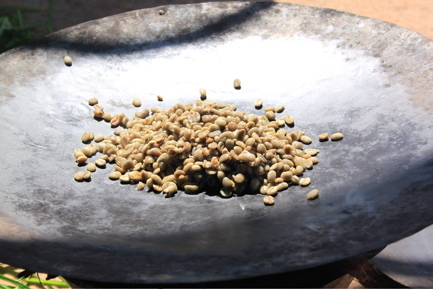 The green coffee, hand washed to remove all silverskin, was thrown on a hot pan and roasted, the beans crushed in a mortar and coffee and water poured into a traditional spouted jar called jebena to steep. Once the grounds had settled she poured us the first round, the abol, the strongest and grittiest brew. You normally drink three rounds, adding more hot water but not more coffee to the jar ad you go, so that the second round is the medium most balanced one, and the third is thin and quite weak. Pulling out my polaroid I was really pleased to be able to take a picture of everyone there that day, especially Addis Alem as she is pregnant with her fourth and looking rather radiant! 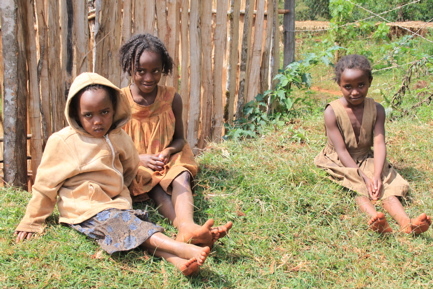 But we wanted to see the Suke Quto nursery before dark and only managed the one round of coffee before we had to leave. Via Wonago and Shakiso city which was heaving with people, music and the smell of coffee roasting, we made our way into a clearing in the forest where the seedlings are kept, near to the three things you need for a good nursery: access to infrastructure, a permanent water source and well drained loamy topsoil. Having a nursery at all is not feasible for all growers, so they might be better off buying in some young trees from the government. 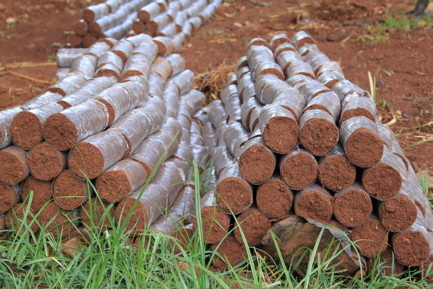 But here, rolls of mixed red earth sand and compost were piled up ready to be planted into, the seeds having been dried gently in the shade to preserve the integrity of the parchment. Placed in a roll of soil at about 1.5 cm deep, the seeds germinate after about 45 days, first coming up as ‘soldiers’ – the tap root lifting the parchment up out of the earth before breaking it off and progressing to the butterfly stage of the cotyledons. 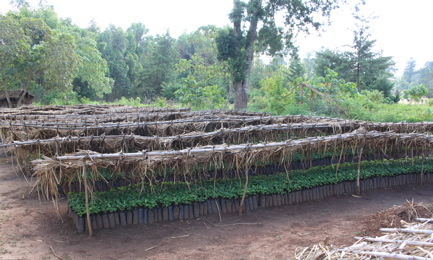 It will take about 8 months before the seedlings are ready to be planted out in the field, so while still growing into their target 8 pairs of leaves, what looked like 6 month old plants were placed snugly in row after row, under covers of straw to protect them from the strong sun. The cover will occasionally be removed for some periods of time to toughen the plants up readying them for their permanent position in the farm. Ready to see the forest where this coffee comes from, we drove via Giroosari to the outskirts of Suke Quto farm at 2000 masl. With the last rain having fallen about a week ago the ground was dry on the surface but the trees looked healthy, this section still in green cherry but other parts nearing ripe. The roughly 7 year old, 3m tall trees were sat in among quite a dense forest, with soft, springy soil telling of the deep layer of nutrients available. 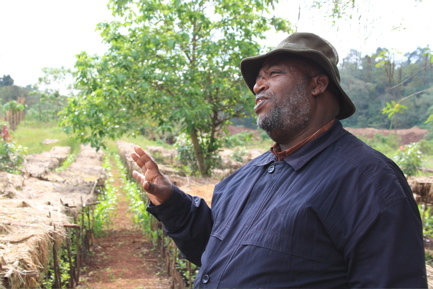 Farm manager Zarihun Admasu was on hand to explain more about how they might prune or stump when required and how they plant the young trees in their permanent locations. I’m really pleased I’ve been able to see the three parts of Suke Quto and have a greater understanding of how it all comes together, and I’m excited to see samples when they’re ready in a few months. Leaving Suke Quto behind we drove the short distance to a neighbouring farm where we were going to spend the night. 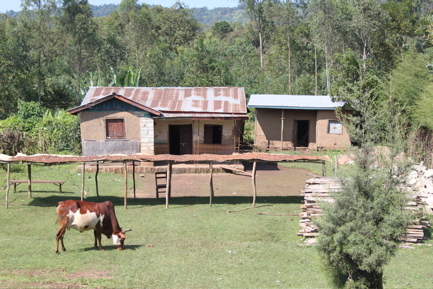 Located on a slope leading up from a small river, it’s a very idyllic setting, but just across the river they were actually digging for gold, this land being valuable for more than just coffee. 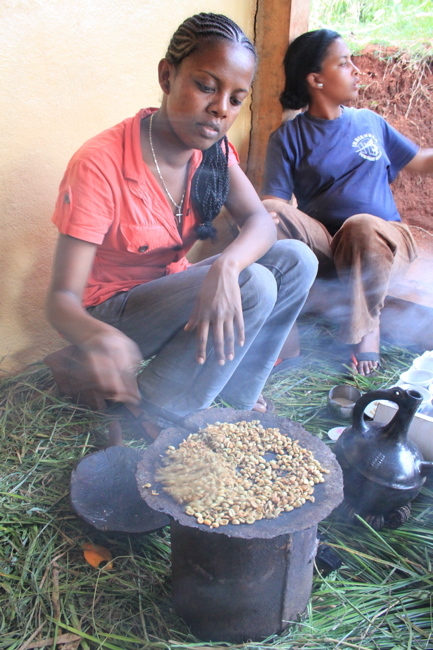 Owner Haile gave us a warm welcome and had a huge late lunch spread ready for us, so putting the farm visit aside for tomorrow we were treated to a coffee ceremony performed by one of his seven daughters. I had a go at the roasting portion myself, but left the call on when it was done to her- roasting over coal is not my specialty! A big barbecue was then set alight and while the bed of coal grew ever hotter, everyone sat around having a drink and a good catch up. 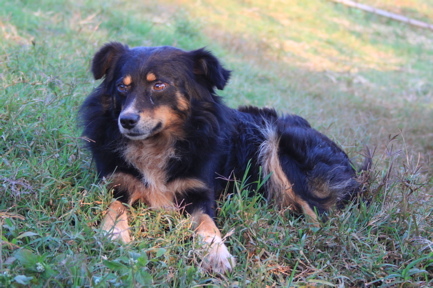 Ever the animal lover I found Tuk Tuk the dog so spent a fair bit of time scratching him behind his ears, until the fire was ready to start roasting the goat that had been slaughtered for our dinner. Over chunks of sweet, tender meat we talked football, gold, hair braiding techniques, Ethiopian dancing and practiced how to count in each others languages. For once conversation wasn’t all about coffee! Finishing the meal with a bowl of delicious soup I felt I might end up asleep in my chair, so I’ve settled into my sleeping bag on the camping beds that they kindly set up for our comfort. I think I’m going to be out like a light any minute now so – till tomorrow! Woken up by the sound of kitten paws scratching around on the floor, it all felt very much like home! Walking out in to the cool morning air and getting wet shoes from the dewy grass between drying beds: definitely not anything like home. While waiting for the rest of the household to wake up I picked some cherries off a tree next to the house and had a great demonstration of what can happen when a tree is stressed out and off balance by growing in less than ideal soil: off the same branch I got a regular cherry with two seeds, a single peaberry and also a triple seeded cherry. Haile told me the triple was very unusual and a sign of good luck, so I’m smuggling this one home to plant it it- all my former attempts of starting a coffee plantation on my windowsill have so far failed so maybe this will be my breakthrough! The farm tour began with an overview of the coffee growing area. 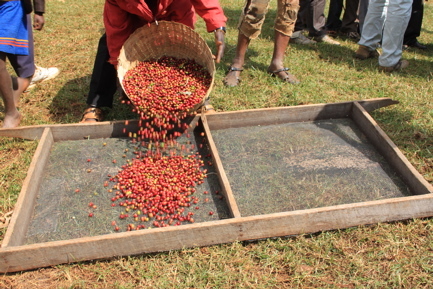 According to Haile, he can identify three different taste profiles from the trees on his land, a Yirga Cheffe quality in the western part, a Sidamo cup from the north slopes, and a Harar-like taste in the eastern fields. He attributes this phenomenon to the fact that his land is under a migratory route for birds, who might be picking up varietals from these areas and dropping them along their path. Having owned this 320 hectare farm for 9 years and keen to find out exactly what he is working with, he’s identified 5 core varietals that grow here and is currently exploring their individual characteristics with a view to intensify production of the best ones. 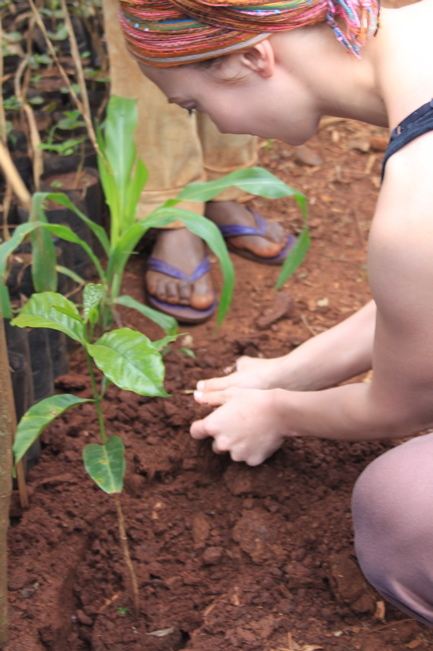 In the forest, he has a stock of 360 mother trees that provide seeds for the nursery on site, and as we walked through the covered rows of young plants I was very honoured to be invited to plant two coffee trees myself. I planted them along one of the rows so that in the future they can help to produce shade for the seedlings, and if I come back in a couple of years my little trees might be full of cherry themselves! 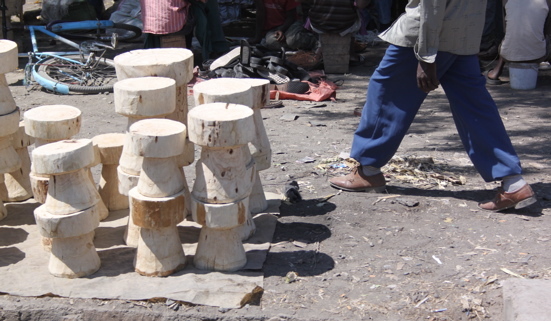 Heading over to some the newly constructed eucalyptus drying beds, the passion for his work coming through in Haile’s word were really great to hear, with his two main philosophies of satisfaction for the consumers and protection of the environment being at the core. Carrying on maintaining and building relationships through trust, integrity and two-way communication is what this man sees as the only way to do business. A short drive to the top of the northern slopes had us on the edge of the 200 meter buffer zone surrounding the coffee trees, providing protection from the dusty roads but also acting as little natural reserve corridors for plants and animals. 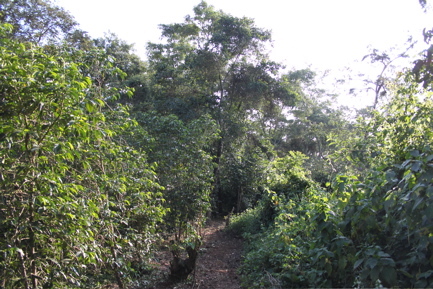 Even beyond this buffer zone of trees there are still about 200 tall and medium sized non-coffee trees per hectare, providing shade of different intensities and giving options for photosynthesis management throughout the season. 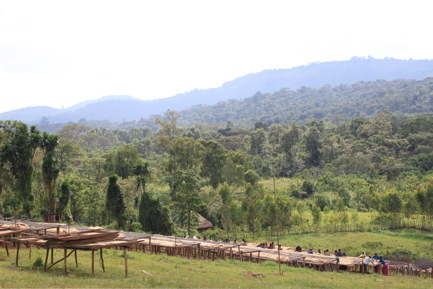 Haile explained how they work the topsoil and undergrowth in rhythm with the rain to maximise the water retention, and as rain is expected very shortly we came across one of the field teams in full swing cutting clearings around each tree to give the rain access to the roots. The cuttings are left to compost and add nutrients back into the ground, completing the cycle. Back in Dilla tonight, an early night for me as the lack of sleep traveling is starting to take it’s toll. The next few days will be a marathon of co-ops, which I’m looking forward to but want to be rested for! 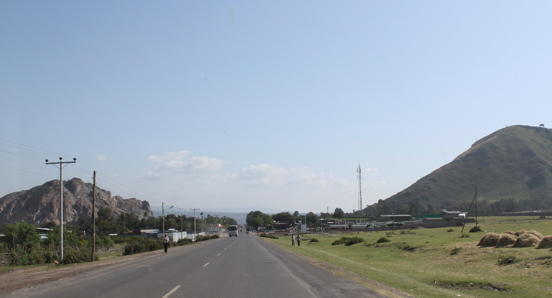 The first stop this morning was the Negele Gorbito co-op, which is under the Oromia Union and situated at about 2000 masl, 30 bumpy minutes off the main road. Aiele the representative from the Oromia Union and Musrat the co-op manager gave us a warm welcome and shows us around the site where this year, 1094 members will deliver their cherry. The size of farms that these members have are bout 1-2 hectares, so a fair amount of land that last year, in a low production year and then with only 904 members, provided 5-6 export containers. 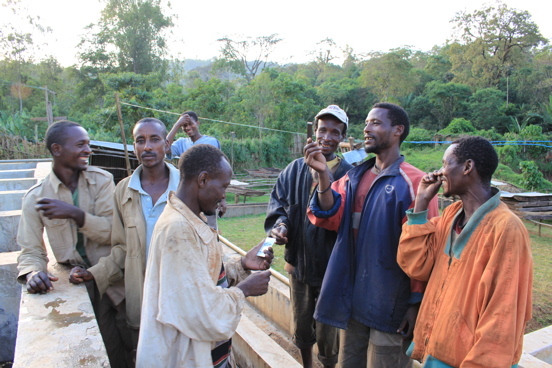 This season they’ve been receiving cherry for 3 weeks, and so far 30 000 kg’s have been bought at 15 birr/kg. They’re gearing up to be able to process 1.5 million kg’s washed and 500 000 kg’s sun dried this year, easily tripling last year’s output. Walking down to the tanks the gentleman raking the parchment explained how he could tell by the sound if there was still mucilage left on the cover, and whether it was time to rinse and post-soak. Grabbing a quick cup of coffee and a picture with a dapper looking chap in a traditional shawl, it was time to say goodbye and we headed to co-op two for the day; Homa. 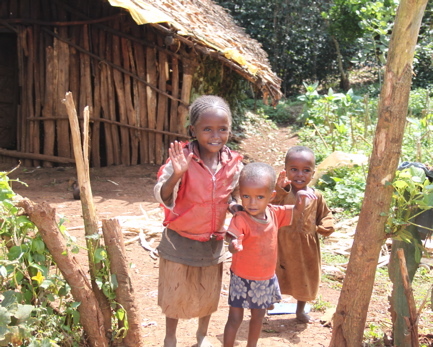 Homa is another co-op under the Oromia Union and headed up by young manager Takele Tardesse. With 789 members it’a a smaller co-op who have suffered from some mismanagement in the past, but are now headed for brighter more stable days and hope to near double the output of last year, to 1 million kg cherry. 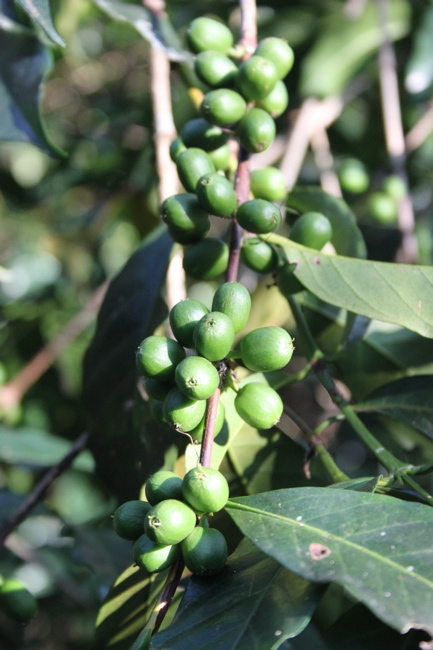 Member farms range in size from 1.75 to 6 hectares, forming a total of 3450 hectares coffee growing land. 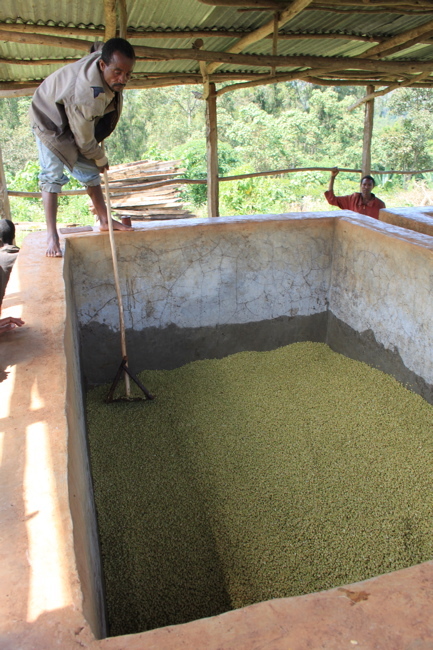 Traditionally they’ve only done washed coffee here but this year the’ve planned to do 400 000 kg sun dried too, experimenting with ways to expand and maximise the potential of the production. They have 73 raised beds but will build more to accommodate both the volume increase overall as well as the longer drying time needed for the naturals. 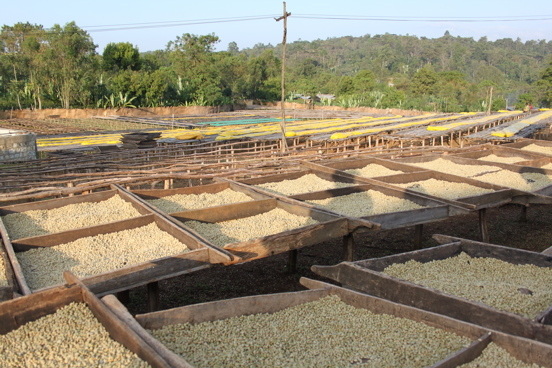 So far this season the average price paid per kg has been 14 birr/kg, and compared to the full season average of 8.86 birr/kg from last year, it says something about how high even internal prices are, not to mention the end price for roasters and consumers. 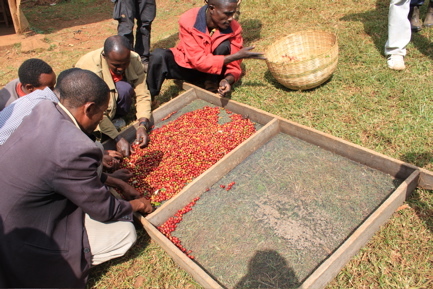 A nice thing we saw here was an element of pre-sorting; as members bring their baskets or bags of cherry in they are poured on to wenfit screens and divided into ripe and unripe before going on to the receiving tanks. 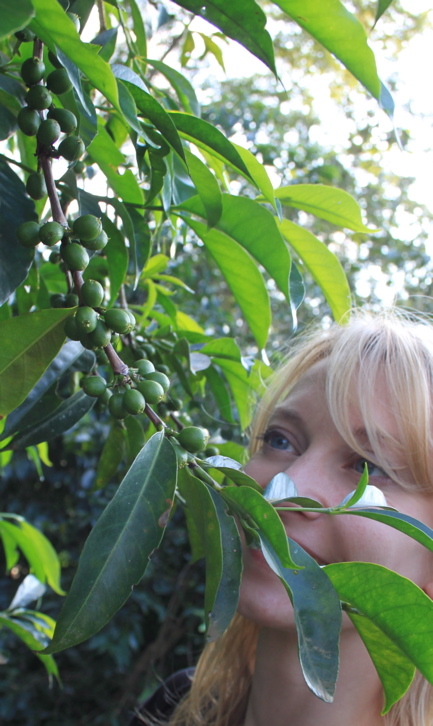 Only the ripe cherries are purchased by the co-op, while the unripes might go back with the grower for home use. 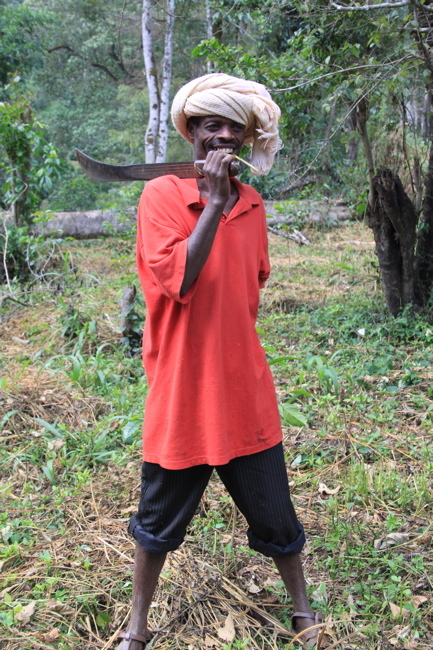 One of the members here, Ture Dembe, took us on a short walk from the co-op to his 1.5 hectare plot, where trees full of ripe cherry spoke of the happy days ahead for him in selling his production! As visits took longer than planned and clouds gathered the hope of seeing 5 co-ops today started looking slim. If it started to rain we’d have problems on the steep dirt roads, so we decided to get just one more done and set off towards Hafursa. 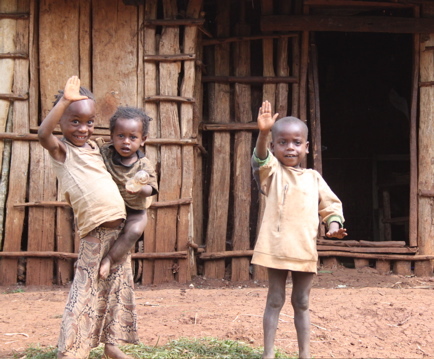 They are under the header of the Yirgacheffee Union, and have 1038 members. Last year they did 547 000 kg cherry but are projecting for 900 000 kg this season. Since opening 10 days ago they’ve done 6000 kg, but for now they’re only doing sun drieds. In a few days they hope supply is steady and high enough to warrant cranking up the pulper, and by the time they hit peak season they want to be doing 30 000 kg each day. As opposed to the concrete receiving tanks I’ve seen so far, Hafursa has a metal version, very smart looking but best of all easy to clean. With pre-sorting for only the ripest cherries in place and a Pinhalense demucilager to process them, this place also has the advantage of being able to skip the 36 hour fermentation soak going straight into a wash and 12 hr rinse. 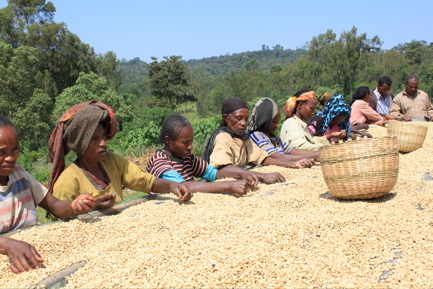 Members can deliver straight to this mill but Hafursa actually have 5 stations in their areas where people can deliver to, also here currently at an average price of 15 birr/kg. No one can quite tell me if this price will stay this high. As cherry comes in in higher volumes it could decline but prices last year, even if lower overall, increased throughout he season. This being a better crop year might keep that from happening, but things for now seem a bit uncertain. As we headed back to Dilla a few drops of rain threatened, but since it stayed dry in the end we went for a meal of tibs at a newly opened restaurant down the road from the hotel, bumping into the only resident American in town. 24 year old Matt is here for 2 years teaching English, and was able to fill us in on life in Dilla from a local’s perspective. Tipping us off that the rooftop of the restaurant was actually a nightclub, we decided to turn a Tuesday school night into disco-time, being the only people up there besides the DJ no hindrance for a bit of bad bopping around and lots of laughs. 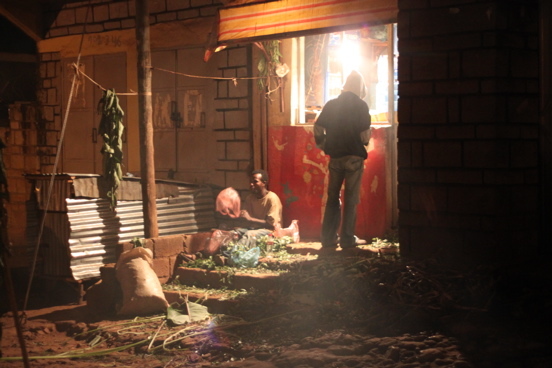 Last night I slept on a coffee farm, tonight I danced to Ethiopian reggae on a roof terrace. It ain’t all bad being in coffee, even if you end up staying in some pretty rough hotels out here in the countryside. Just now as I was typing waiting for my hair to dry after a long awaited shower, a little cockroach crawled through my fringe past my eyes… I do not know how he ended up in my hair but I sure know that he’s now flat under a shoe. My animal loving nature sadly doesn’t stretch to this sort of up close and personal with creepy crawlies!